Seth Godin, in his book “Purple Cow,” notes that the phrase “you can’t out Amazon Amazon” was once posted on a banner in Walmart headquarters as the company was deciding whether to venture into online retail business. The point was that the company should find its own path rather than emulate – and lose to – its competitors. While an institution of higher education is not a retailer, and SIU is certainly not Amazon or Walmart or any of their competitors, we can think about this message within our own context. We are not the major research university to the north of us, and we are not the regional university to the south. We shouldn’t try to be either. We are SIU, and we need to define and communicate what makes us remarkable if we are to stand out to prospective students. We need to ensure that people perceive us not as just another university, but as an exciting, forward-looking academic community. We can start by embracing our strengths. We are a research university that is small enough to provide personal, hands-on experiences yet offer a breadth of comprehensive programs. We provide every student – not only a few – with outstanding opportunities for experiential learning, from research to creative activities to community service to leadership. And we provide these opportunities early in a student’s academic career. We can emphasize these strengths by further building extraordinary opportunities for personal growth through expanded focus on experiential learning and a robust campus life. Academic reorganization can create further distinctiveness. We can deliver an educational experience outside the lane through innovative academic offerings. Our goal should be to prepare students for the challenges of tomorrow and a fulfilling 40-year career. Our focus on updating the core curriculum will focus on growing the whole person – communication skills, people skills, cultural competency and personal development. Our graduates will stand out not only because of what they know, but also because of who they are. Even as we grow enrollment, targeting an optimal size of 18,300 by 2025, we can maintain a personalized approach that makes every student feel like a valued member of our community. 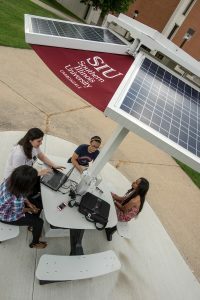 This sense of being a Saluki, part of a family, is an SIU trademark that we should cherish even as we improve upon it through strong student services and positive, meaningful interaction with faculty members. Every student should be treated as a member of a tight-knit community in every engagement – from the first email, phone call or visit through graduation and beyond. As we embrace our strengths and revitalize our academic programs and student services, we can stand out as an institution that provides an elite, private university experience with a public university cost, a breadth of comprehensive programs that can be matched by few private institutions, and a remarkable student experience that leads to well-rounded graduates prepared to become 21st century leaders. We are on our way. I welcome all you do to help shape our remarkable future.